Do you have an idea for a day trip? Please send it to us! We would love to feature your special location here in our directory. Use the Contact form to send us your trip suggestion. The Coral Castle is an everlasting mystery to those who explore it. If you had visited Coral Castle 60 years ago, you would have been greeted enthusiastically by a man weighing a mere 100 pounds and standing just over 5 feet tall. He would have asked you for ten cents admission and introduced you to his fantasy world carved out of stone. The entire complex was built between 1920 and 1940 by and for one man working alone and in secret. His name was Edward Leedskalnin. Now we wonder what exactly was the source of inspiration that drove this man for 28 years to carve a Coral Castle from the ground up using nothing but home made tools from junk parts. Unrequited love? Ancient sciences that defy gravity, or just sheer, raw human determination? Located in Miami, Fl, it has been said to be Florida's and perhaps the world's most bizarre place. Among its oddities is a scattering of oversized chairs made of coral, each one weighing a half-ton. Although they look extremely uncomfortable, the chairs are, in fact, exceptionally restful and balanced into perfect rockers. Remarkably, not a single tool mark has been found on any of them. Take turnpike extension to Miami, take exit # 5 (288th St.), go right for 2 miles to SW 157th Ave., turn right. 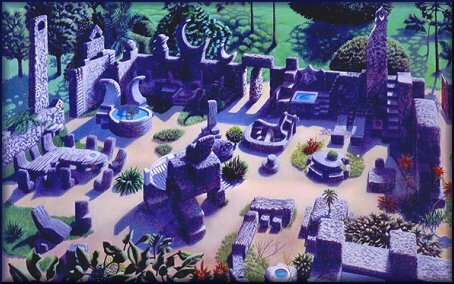 Below you can see an Artists incredible accurate rendering of th Coral Castle. Don't miss this spectacular, mystical place!